Have you read @stoodle’s exorcising demons post? If not, go read it. All the way to the end. Pop quiz: what did Mattie list at the end? Answer: 10 good things he’s doing as a teacher. Because he can READ MY MIND, I’ve been thinking about that as well. What started it for me was watching “Your Inner Fish,” a documentary that explains how our bodies evolved (I highly recommend both the documentary and the book! Fascinating stuff!). In it, the paleontologist was looking for a fossil in the arctic. He found something promising in 2000, but the season is only about a month long, so he had to go back to find what he was looking for the next year. And the next year. And the next year. And, yes, the next year. He finally uncovered it in 2004. Meaning after he found the right spot, it still took him four years to see the results. So I started to think, “Man, I wonder if I could be so dedicated for something for four years without seeing the results.” Oh, wait, that’s what I do every day as a teacher. If I quantify each day, I rarely say, “oh, look how much I improved today!” But if I look at where I was four years ago, I think I can safely say I’ve been improving! 2. Making Powerpoints. Yes, this is different from #1. Why? Because the ants crawl up the function and fall through the undefined hole in my limits one. 5. I’m really good at function transformations (except I sometimes get obsessed and want to spend 3 weeks on them). 7. I (think) I’m a good sounding board when other colleagues have math questions or want to bounce ideas around. I’ve taught a lot of different courses and levels and know a lot of pitfalls to avoid. 8. I’m good at making connections between disparate topics (again, sometimes I get too obsessed with this and need to focus on the current lesson!). 9. I try new things. This is the first year students have been in groups since Day 1. 10. Students leave my class knowing how to graph y=x. So what are your #10goodthings? 1. Blog more. Remind self that I don’t have to type a novel every time, nor does anyone want to read a novel on a blog. Keep up with short 3-2-1 summaries. 2. Exercise more. I joined the #500in2015 challenge and did pretty good the first week. To motivate myself, if I keep my goal of ten miles a week in January, then I get to buy the new Jessica Smith walking workout video set. (Right now I’m using this DVD from her. The Nike+ app seems to record the walk pretty accurately and I’m not going outside when it’s below freezing! 55 degrees!) If you’re looking for a good indoor workout, check out her website–she has TONS of free full-length workouts posted, with special appearances by her dog, Peanut. 3. Leave school at school. This has been one of the more trying years I’ve had as a teacher and I’ve been bringing a lot of that home with me. I’m going to try to be better about shutting that part of my brain off. 2 good lessons this week! 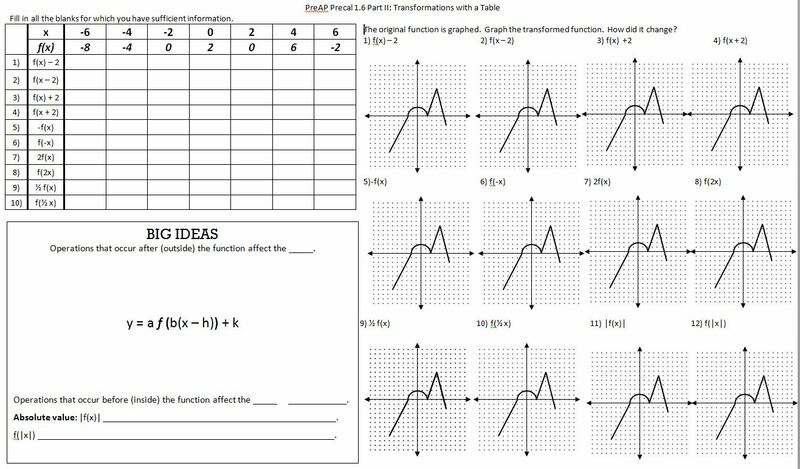 (Note: there is no table for the absolute value functions because my coteacher and I wanted them to thinking about those on their own for a bit). Next year, I think I will use up some extra paper and recopy the table next to each graph. Because being able to mark it up adds a wonderful visual to what happens when we affect the input, for example, f(x – 2). THIS TOTALLY BLOWS MY MIND EVERY YEAR. 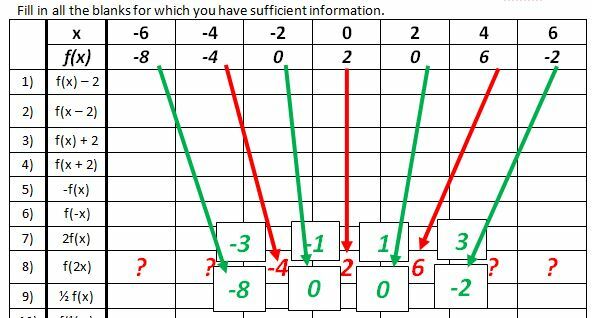 We are “reaching back” 2 to find the output value, which will “pull up” to where we are. SO THAT’S WHY IT SHIFTS TO THE RIGHT WHEN SUBTRACTING. 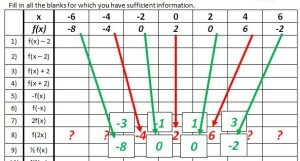 We then talked about the “bonus” point of (8, -2) we could get from the original (6, -2). HOLY COW YOU CAN TOTALLY SEE THE GRAPH BEING PULLED IN!! We need to go out twice as far, then pull that answer back in to our x-value. We spent two days on this, then did some more practice. 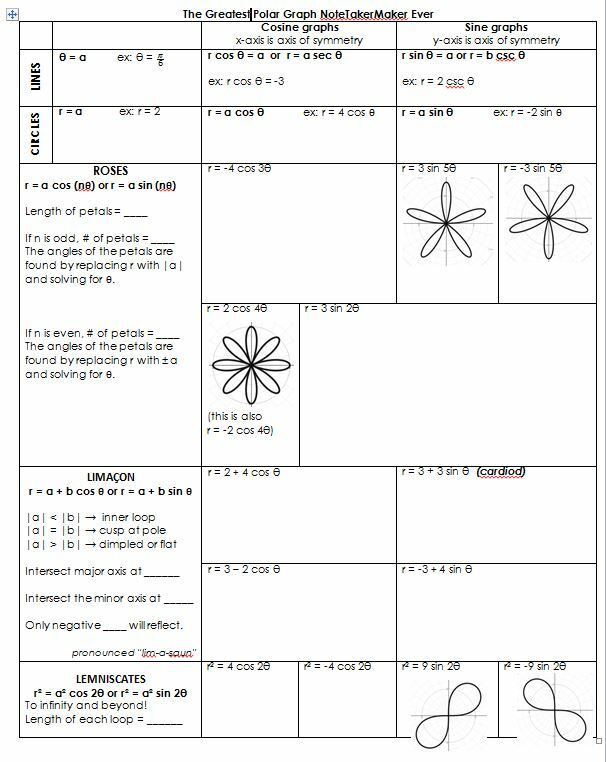 Monday we’re doing a super-thoughtful-hope-they-all-ate-their-wheaties worksheet combining transformation, average rate of change, and area of the curve. I will report back as to its success and/or not-there-yet-ness. More transformations!!! Seriously, I love these.